For the stage play, see Crimes of the Heart. Crimes of the Heart is a 1986 American southern gothic film directed by Bruce Beresford. The screenplay by Beth Henley is adapted from her Pulitzer Prize-winning play of the same name. The film tells the story of the three Magrath sisters, Babe, Lenny, and Meg, who reunite in their family home in Mississippi to regroup and settle their past. Each sister is forced to face the consequences of the "crimes of the heart" she has committed. The story focuses on the Magrath sisters—Lenny, Meg, and Babe—who reunite at the family home in Hazlehurst, Mississippi, after Babe shoots her abusive husband. The three were raised by Old Granddaddy after their mother hanged herself and the family cat and have been eccentric ever since. Lenny is a wallflower who bemoans her shriveled ovary. Egocentric Meg is a singer whose Hollywood career ended abruptly when she suffered a nervous breakdown. Unruly and impulsive Babe shocks her sisters with stories about her affair with a teenage African American boy. Past resentments bubble to the surface as the women are forced to deal with assorted relatives and previous relationships while coping with the latest incident that has disrupted their dysfunctional lives. The film opened on 246 screens in the US and earned $1,402,921 on its opening weekend. It eventually grossed $22,905,522 in the United States and Canada. Crimes of the Heart received positive review among critics. Roger Ebert of the Chicago Sun-Times called the film "that most delicate of undertakings: a comedy about serious matters. It exists somewhere between parody and melodrama, between the tragic and the goofy. There are moments when the movie doesn't seem to know where it's going, but for once that's a good thing because the uncertainty almost always ends with some kind of a delightful, weird surprise. The underlying tone ... is a deep, abiding comic affection, a love for these characters who survive in the middle of a thicket of Southern Gothic clichés and archetypes." Rita Kempley of the Washington Post described it as "Hannah and Her Sisters with a southern accent, a lilting gingerbread gothic with Diane Keaton, Sissy Spacek and Jessica Lange ding-a-linging harmoniously as Dixieland belles" and added, "Playwright Beth Henley has no dire message for us, but her adaptation is nicely restructured, glib as all get-out and character-wise ... The powerhouse performances are directed by Bruce Beresford, who maintains balance among the actresses and keeps a lovely tone and smooth pace. As with his critically acclaimed Tender Mercies, the Australian director again looks at American types with a fresh eye." The film was nominated for the Golden Globe Award for Best Motion Picture - Musical or Comedy but lost to Hannah and Her Sisters. Sissy Spacek was nominated for the Academy Award for Best Actress, won the Golden Globe Award for Best Actress - Motion Picture Musical or Comedy, and was named Best Actress by the Kansas City Film Critics Circle Awards and the New York Film Critics Circle. Tess Harper was nominated for the Academy Award for Best Supporting Actress, and Beth Henley was nominated for the Academy Award for Best Adapted Screenplay. ^ DE LAURENTIIS REJOINS THE RANKS--AT EMBASSY: DE LAURENTIIS: EMBASSY Friendly, David T. Los Angeles Times 16 Nov 1985: e1. 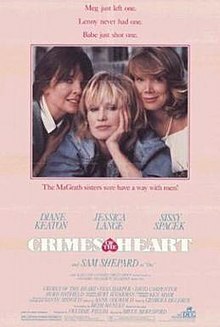 ^ "Crimes of the Heart (1986) - Box Office Mojo". www.boxofficemojo.com. Retrieved 1 May 2018. ^ Ebert, Roger (December 12, 1986). "Crimes of the Heart". RogerEbert.com. Ebert Digital LLC. Retrieved May 1, 2018. ^ Kempley, Rita (December 12, 1986). "'Crimes of the Heart'". Washington Post. Retrieved May 1, 2018. This page was last edited on 24 December 2018, at 07:23 (UTC).